I’ve tried chile beer before, which is never exactly “good”, but interesting. You get the base flavor of beer, plus a little bit of heat from the pepper extract. 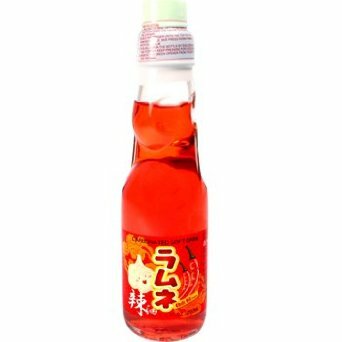 But Ramune Chili Oil Soda is wretched, marrying the bitter flavor of peppers and the sickly-sweet corn syrup with red food dye and zero chili heat to distract you from the nastiness. It’s six ounces, but I couldn’t get past the neck of the bottle before chucking it. For those brave enough to finish the Chili Oil Soda, the next level is Ramune Takoyaki Soda – which claims to emulate the flavor of fried dough balls. I wanted to tell you what this tasted like, but I couldn’t get past sniffing the open bottle. Maybe you’re braver than I am, or your taste buds don’t work, or you need to win five bucks by drinking something bad, in which case this would be right up your alley.